Installing electrical outlet insulation prevents cold air from coming in during winter, and cool air from leaving during summer. Insulating outlets is a simple task that can be completed in a few steps. 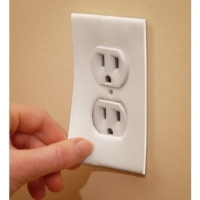 Install these foam gaskets behind electric outlet plate covers to reduce drafts. If you have double or triple gang boxes, use multiple overlapped gaskets and trim them to fit the outlet. Manufactured from UL listed material that meets UL94HF1. UL 94, the Standard for Safety of Flammability of Plastic Materials for Parts in Devices and Appliances testing is a plastics flammability standard released by Underwriters Laboratories of the USA.